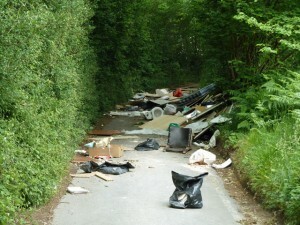 A lorry carrying a full load of waste has dumped the entire contents on a country road in north east Derbyshire. The fly-tipping incident was reported to the police on Tuesday, December 20 at around 7am. The lorry load of waste was scattered across the whole of Morton Lane, in the village of Apperknowle in Derbyshire, blocking the entire road. The waste dumped on the road included, wood, mattresses, garden chairs, car parts, cardboard boxes, building and garden waste. A spokesman from North East Derbyshire District Council has described the incident as an absolute disgrace and an investigation is now underway to try and find those responsible. The fly-tipped rubbish will now be looked at closely to see if any evidence of where it came from and who dumped it can be found. Those responsible could face serious charges if found guilty; a fine up to £50,000 and/or a 12 month jail sentence. The tidy up of the rubbish was supervised by the police but the actual offence of fly-tipping is not classed as criminal, which leaves prosecution down to local authorities. Please click here to find out more about our business waste management services.